President Obama enjoyed a towering victory days ago that I feel leaves the GOP reeling, although they are spinning the Supreme Court's validation of Obamacare as a great gust of wind at their backs. While I would not have expected a different response from them, I fear that there is a developing wind that may blow them away in November. I offer this analysis as a tepid Romney supporter who will be voting more against Obama than I will be voting to support Romney. The phrase Obamacare is peppered throughout this blog. I was recently chastised by an unabashed whale-saving tree hugger that I should abandon this derisive term which detracts from my otherwise unvarnished objectivity. On the evening that the Supreme Court's decision was announced, I was watching CNN and its pontificating pundits. Various panelists were spewing forth verbal pabulum telling us benighted listeners what we were supposed to think. John King, the moderator, and many members of the spin squad all used the term Obamacare freely and repeatedly. If CNN, the apotheosis of journalistic excellence, permits this term to be aired, then surely the Whistleblower is entitled to a free pass on this. We now know that Obamacare is constitutional which offers no support for the merits of the Affordable Care Act. While there are elements of the plan that I do support, I am deeply skeptical that the plan will control costs and increase medical quality. My fear is that medical costs will continue to escalate and that medical quality will suffer as physicians and hospitals compete in the pay-for-performance Follies where medical documentation and check mark medicine, not medical quality, is rewarded. Is the price for increased access to medical care for the uninsured medical mediocrity for all? --Can the physician take an accurate medical history? --Can the physician skillfully examine patients? I'm a gastroenterologist. I'm supposed to know how to palpate the liver and perform other diagnostic tasks with my hands, eyes and ears. These skills will never be assessed by the government or insurance companies. Does that that they don't matter? --Does a physician know when an incidental 'abnormality' on a CAT scan can be ignored? --Does a physician know how to deliver bad news to patients? --Does a physician know when watchful waiting is the right prescription? --Does the physician know how to manage medical issues on the phone at night when he does not know the patient? Which of them should be sent to the emergency room? Why not send them all just to be safe? --Does the physician know when to consult a specialist? Is sending every patient with chest pain to a cardiologist good medicine even if patients and specialists encourage this practice? A majority of Americans oppose Obamacare in whole or in part. This opposition has developed even before the plan's bitter medicine has been swallowed. Can the administration continue to spin this by suggesting that the public doesn't yet grasp the plan? Are we really that dumb? Chief Justice John Roberts has pulverized the liberal argument that the Court is an arm of the Republican Party, as was bitterly alleged in Bush vs. Gore in 2000. While public support of the Court has been gradually ebbing, I have not personally believed that the justices pass their decisions through a political prism. Of course, they have different judicial philosophies, which is quite different from acting as a political partisan. Not only did the Chief Justice validate Obamacare, but he did so by joining the Court's four liberal members to do so. I would have never predicted this and I doubt that many readers what have either. Chief Justice Roberts has the long view, and sees the Affordable Care Act as a speed bump. His overriding priority is to protect and defend the integrity of his institution. I feel that he deserves praise and respect for his decision, even though I was hoping for a different outcome. Had he joined with the Court's conservative members and overturned Obamacare, he would have been lambasted by the political left. Why aren't they praising him now? Wouldn't such a response from them be "fair and balanced"? Fairness means applying the same standard in all circumstances. 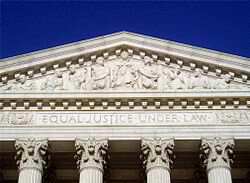 It reminds me of the iconic four word phrase carved into the facade of the Supreme Court. Equal Justice Under Law.